Republicans and Democrats must come together and find compromises to shore up the insurance exchanges or they will all face the blame as insurers flee the markets and consumers lose options for coverage, the chair of the Senate health committee said Wednesday. Sen. Lamar Alexander (R-Tenn.) said he believes lawmakers can work across the aisle to appropriate money for cost-sharing reductions and add flexibility to the Section 1332 waiver system, and he wants to produce a bipartisan bill by the end of next week after back-to-back hearings on the issue. Alexander supported a full repeal of the Affordable Care Act, but he's now seeking short-term fixes that can lower premiums for 2018 and be passed before insurers must finalize their 2018 rates. Many insurers, tired of higher-than expected claims, have exited counties where they once sold policies, leaving large swaths of the country with no competition on the exchange. But finding support for one proposed solution—reinsurance funding — won't be easy. "Clearly, reinsurance is one part of the solution for a long-term fix," Alexander said. Four of the five current and former state insurance commissioners testifying before the Senate Health, Education, Labor and Pensions Committee on Wednesday also called for the return of federal reinsurance funding, at least until states could design their own programs. The Affordable Care Act included a reinsurance program for the first three years of the exchanges, and it expired this year. The billions of dollars in federal funding would help insurers offset the costs associated with the most expensive patients, and could entice insurers to return to the ACA exchanges, according to Tennessee's insurance commissioner, Julie Mix McPeak. That issue has yet to garner bipartisan support. 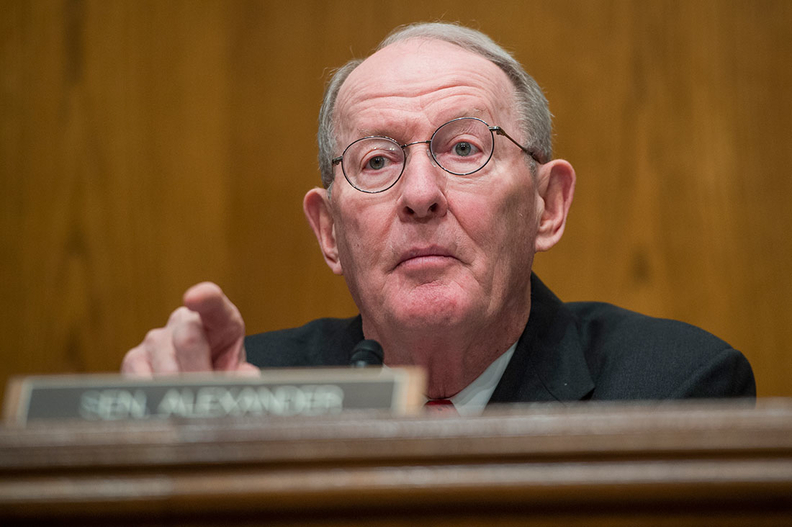 While Democrats have backed renewing reinsurance funding, Alexander and other Republicans have leaned toward guaranteeing cost-sharing subsidies through 2018 and providing greater flexibility around ACA requirements. "If reinsurance is such a good idea, why don't states do it? All it takes is money," Alexander said. "If the answer is our legislature won't approve any more money, that's not a very good answer." Senate Democrats have asked Republicans to guarantee cost-sharing subsidies for longer, and Ranking Member Patty Murray (D-Wash.) accused President Donald Trump of attempting to "sabotage" Obamacare by repeatedly threatening to stop paying the CSRs. Her request also garnered support from the state commissioners, who said CSRs should be guaranteed for at least two years. Washington Insurance Commissioner Mike Kreidler said maybe two years wouldn't be enough, since insurers are already working on 2019 rate-setting. The uncertainty has been blamed for rising premiums and insurer exits. McPeak said about two-thirds of Blue Cross and Blue Shield's rate request increase in Tennessee stems from the questionable future of CSRs. Republicans have also homed in on providing states with more flexibility for 1332 waivers. Although ACA advocates have worried that Republican proposals would undermine consumer protections, Alexander focused on process changes for the waivers that would cut out some of the red tape. Those changes include a shorter waiting period for approval or allowing governors to apply for a waiver without legislative approval. Five governors will testify in front of the committee Thursday morning, and other senators who are not on the committee will have the opportunity to ask questions before the hearing. On Wednesday, 31 senators came to that pre-hearing session, "a remarkable level of interest," Alexander noted. Providers, insurers and other stakeholders will testify before the committee next week. Teresa Miller, who just stepped down as insurance commissioner in Pennsylvania, said after the hearing that the senators seemed focused on finding solutions and they were surprised at how much the commissioners agreed on solutions, despite their ideological differences. "It makes me optimistic we might have a proposal here," she said.